Alchemy is all about using easily accessible items to create ones that are harder or more expensive to obtain. Every Production Skill requires ingredients; some can be acquired with the gathering skill, but most come from defeating monsters. Mousing over items that you have acquired will let you know what type of Production Skill uses them. You may only learn 2 production skills. If you are interested in finding out more about each Production Skill before choosing one, read the brief descriptions at the bottom of this guide! Press K to open your skill list and click the ‘Alchemy‘ square in the top right. Remember that pressing ‘K‘ will always bring up this window, or you can click on the book near the bottom-right corner of your screen. You won’t be able to learn or use any production skills if you are on a mount. A window showing the 5 different production skills will pop up. Right-click on a skill icon to learn it. 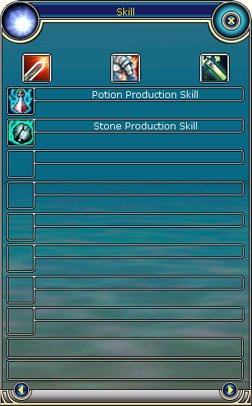 The icon will appear at the top of the production skill window. Click ‘Okay’ at the bottom of that same window. You will be prompted to confirm your choice. Click ‘Okay‘. Open your skill window again with the ‘K‘ button and click on the ‘Alchemy‘ button once again. You will now see the production skill that you learned. Right-click that production skill to open its menu. 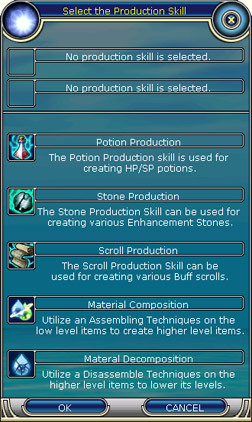 You will now see a list of different items that can be created, depending on which production skill you chose. Obtain the proper ingredients, which are listed to the right of the item you want to create, and then click ‘Produce‘ at the bottom. You will level up your Production skill when creating items. At higher Production Skill levels you can buy better recipes from NPC’s, like Skill Master Ruby in Roumen. Production Skills may be unlearned by purchasing a ’Production Skill Reset’ from the Fiesta Store. 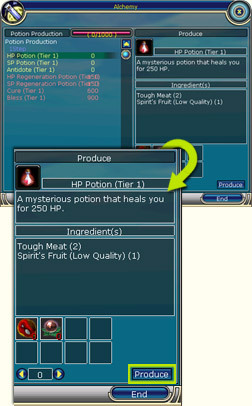 With this Production Skill you will be able to make HP and SP potions, as well as HP and SP regeneration potions that give you health or spirit back over time. You can also create potions to protect you and your friends from poisons, curses, and diseases. This production skill is used to create enhancement stones (Elrue, Lix, and Xir) that are used to upgrade your weapons and shields. Upgrading your gear will result in a stat boost. If you enhance your gear enough times, you can even make it glow! Read the for more information. which sometimes drops from defeated monsters. 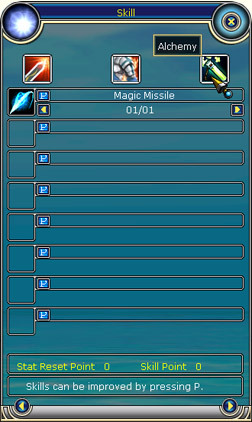 from higher level items in combination with an Alchemy Stone.